Portland Realtor Fun Tips: Trek Portland’s 4T Trail: Trail, Tram, Trolley, & Train | Everything. Portland. Real Estate. Blog. Praise of Portland’s public transportation system and hike- and bike-friendly attitude has been heard nationally for quite some time. The Portland Transit system is used by all kinds of people, from business women in power suits and doctors in scrubs to kids on their way to school and, now, tourists and locals looking for a comprehensive way to see the town via a relay of the “4T trail” – a scenic loop that takes adventure buffs and sight seers around Portland’s northwest and southwest quadrants by train, trail, tram, and trolley. This 8.5 mile loop takes you from downtown Portland to Council Crest (Portland’s highest point at 1,073 feet) and back to the river, winding through forested parks, past the best restaurants in the country, classic examples of historical Northwest architecture, examples of our scientific, artistic, and environmental ingenuity, and unsurpassed views of the colorful city skyline, sparkling river, and the snow-capped peaks of Mounts Hood, St. Helens, Adams, Jefferson, and Rainier. The allure of the 4T Trail lies in the ability to “get away from it all” without having to leave town. Because of Portland’s early legislation designating green spaces and park preservation, it’s now possible to trek through veritable forests within one of the most exciting cities in the country and be back in time for a gourmet meal or a pint at one of our world-famous brewpubs. You can start your adventure anywhere along the loop, weaving through downtown and taking the MAX to Washington Park Station (North America’s deepest transit station 260 feet below the hills). Up in the hills you’ll find the Oregon Zoo, The International Rose Garden, and the Japanese Garden – then set off on a 3.95 hike through the city’s gorgeous Council Crest Park with the best views in the Northwest. As you end the park section of the trail, you can choose between a challenging forest hike through Marquam Park or a shortcut through the Fairmont Neighborhood, eventually ending up at the Marquam Hill campus of the Oregon Health and Science University where you can ride the Portland Aerial Tram for a smooth three-minute ride to the South Waterfront, the largest sustainable redevelopment project in the nation (the ride is free in this direction!) and then hop on the streetcar (or “trolly”) for a scenic ride through Downtown, returning you to your starting spot. If you take your trip on a Saturday, you can ride the Streetcar to the Portland Farmers’ Market on the Portland State University Campus, voted the best farmers’ market in the country by many national magazines. Under the leafy green trees of the South Park Blocks, you can take a stroll past the colorful harvest of the region, sample wines and chocolates from local artisan producers, or rest your legs and listen to some great local music. The trail isn’t just for tourists – many Portlanders take advantage of the 4T trail to see their city in a new way and take in all of the newly upgraded transportation options. You haven’t really seen Portland until you’ve seen it from the aerial tram, and the MAX light rail system and Portland Streetcar are utilized by everyone in town. 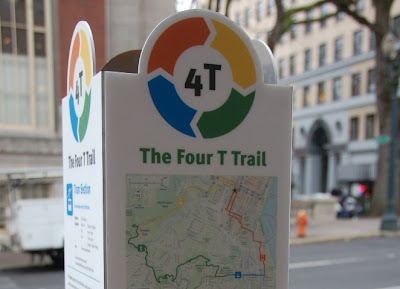 The 4T Trail is an exciting way to see every part of the west side of Portland, and leads you to different adventures every time. Whether you’re relocating to Portland and looking for the perfect neighborhood to buy a home, or you’ve lived here for years and just want to stretch your legs on one of these beautiful summer afternoons, the 4T trail provides the perfect way (or 4) to get you there. This entry was posted on Thursday, July 8th, 2010 at 12:50 pm and is filed under Uncategorized. You can follow any responses to this entry through the RSS 2.0 feed. Both comments and pings are currently closed.